Although a printer pool is a single logical printer that supports multiple ports, or printers, the reverse structure is more common and more powerful: multiple logical printers supporting a single port, or printer. By creating more than one logical printer directing jobs to the same physical printer, you can configure different properties, printing defaults, security settings, auditing, and monitoring for each logical printer. For example, you might want to allow executives at Contoso, Ltd. to print jobs immediately, bypassing documents that are being printed by other users. To do so, you can create a second logical printer directing to the same port (the same physical printer) as the other users, but with a higher priority. Use the Add Printer Wizard to generate an additional logical printer. To achieve a multiple logical printer-single port structure, additional printers use the same port as an existing logical printer. The printer name and share name are unique. After the new printer has been added, open its properties and configure the drivers, ACL, printing defaults, and other settings of the new logical printer. To configure high priority for the new logical printer, click the Advanced tab and set the priority in the range of 1 (lowest) to 99 (highest). Assuming that you assigned 99 to the executives' logical printer, and 1 to the printer used by all users, documents sent to the executives' printer will print before documents queued in the users' printer. An executive's document will not interrupt a user's print job. However, when the printer is free, it will accept jobs from the higher-priority printer before accepting jobs from the lower-priority printer. To prevent users from printing to the executives' printer, configure its ACL and remove the print permission assigned to the Everyone group, and instead allow only the executives' security group print permission. Exam Tip Remember that a printer pool is a single logical printer serving multiple ports, and all other variations on the standard print client—print server—printer structure are achieved by creating multiple logical printers serving a single port. How to set up a second logical printer from the same printer on windows server 2003? How to configure the same printer with different jobs? 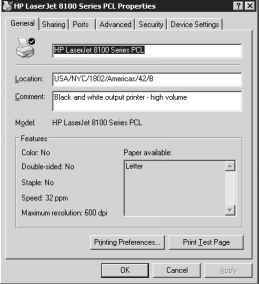 How to create a logical printer windows? How to set "logical printer" driver in windows? How do i create a new logical printer on windows server?